Hey there! I hope you all had a fun 4th of July week! David took off an extra day on the 5th so we got to enjoy some extra “Daddy time” before he went out of town to visit a buddy from college. Today I wanted to share a bit about what’s been going on over here with the Tenneson household the past few weeks. We have been doing a good bit of swimming at my parents’ pool lately. I’ve mentioned before that Audrey is a little fish who loves the water, and Raley is the exact opposite. She is very comfortable swimming around with her puddle jumper on, but does not like to put her face in the water, jump in, be thrown in the air, or be splashed in the face. Basically she wants to float around with her face above water, on her own terms. A few weeks ago the girls woke up from their naps around 4:30 and I randomly decided to take them over and have a little evening swim – something we hadn’t really done all summer. David met us over there after work, we ordered some pizza, grabbed some popsicles and swam until the sun started to go down. Audrey loves to be thrown into the air as high as you can possibly throw her and kept asking David to throw her “really really higher! Again! Again!” We have to tell her after a while to take a break because she would literally do it all night. We’ve also mastered the cheerleading lift. David doesn’t like the idea of the girls cheering, but he may have to admit that they have it in their blood. And since this little daredevil has no fear, I can definitely see her learning to tumble easily. I often wonder what they will enjoy and excel at as they grow older and start to explore new activities and sports. Will they like the same things we did or will they enjoy doing something completely different? Do you wonder the same about your kids? We had a fun little morning out a couple weeks ago with my friend Erica and her girls at Early Works. It’s so funny to see the two older girls pair off and play and the younger ones do the same. I think they could play with these dogs all day. The little dress up clothes are too cute! The next week we went to the Food Truck Rally in downtown Huntsville. We had not been to downtown Huntsville (Big Spring Park area) since they cleaned it up and remodeled the area, but it is beautiful now! I honestly would try to avoid going down there because it used to be kind of run down and sketchy, but I won’t avoid it any more. I’m glad they are fixing up downtown because I like when I visit other cities and they have a cool downtown area. Huntsville is becoming one of those cities! Anyway, after we ate some great food and walked around the park a bit, we decided to go to Pints and Pixels and play some games. Playing games together, golfing, bowling, etc. have always been activities that David and I enjoy doing together. “Recreational companionship” is definitely high on both of our “needs” list, so we often find ourselves doing things like this on our date nights, rather than going to a movie or shopping. Our last date night of the month was dinner at Connor’s for our anniversary followed by walking around Bridge Street for a little bit and ice cream at Maggie Moo’s. 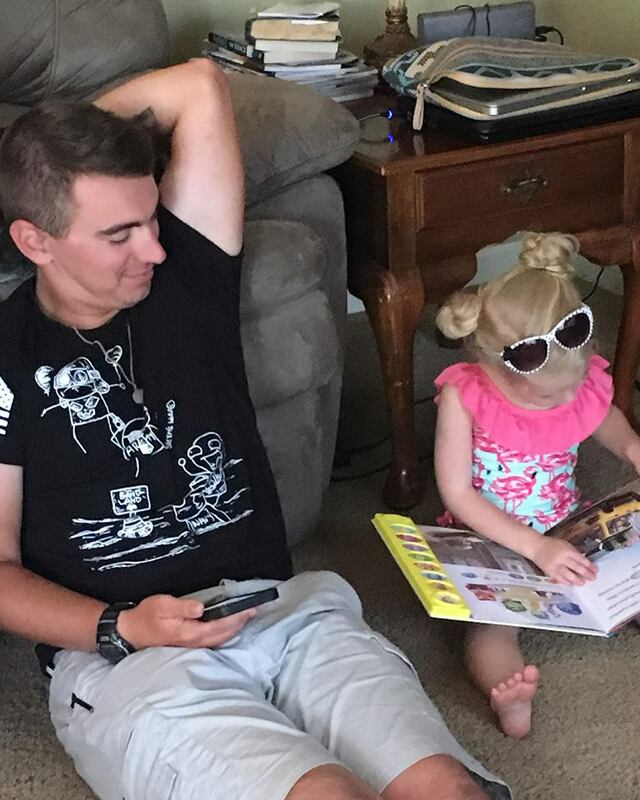 My neice Addy had her second cochlear implant surgery a couple weeks ago, so big sister Payton came back home to stay with my parents for the week after the surgery so that Addy could heal and so Brian and Shannon could give her the attention she needed to recover. We took advantage of her time here in Madison (they live in Atlanta, so we don’t get to see them much), by going on morning outings, swimming, and letting all the girls have a sleepover at my parents’ house (they’re some brave grandparents). One morning we packed a picnic lunch and went to the Huntsville Botanical Garden. The geese were so funny with the girls. They were all outside of the pond at first and the girls were talking to them and watching them. Then we went around the pond to look at the turtles and the geese got in the water, swam across the pond, got out where they were and walked back up to them. I’m not sure if they thought we had food or what, but it was incredibly cute. When we go to the garden we tend to spend a majority of our time in the wading pond. It’s a great way to cool off, especially for them! I try to wear something that I don’t mind if it gets wet, and pop a squat on the rocks that line the pond so I can put my feet in and cool off as well. The butterflies in the Butterfly House are beautiful this time of year! If you live in the Huntsville area, I highly recommend paying a visit to the Huntsville Botanical Garden and checking out the butterflies. The turtles in the Butterfly House are fun to watch too! Another morning while Payton was in town we went to see Storks at the movies. Some of the local theaters have dollar kids’ movies throughout the summer, so we took advantage of this. My friend April and her little boy Bennett joined us as well. Audrey and Bennett are adorable together. Bennett says Audrey is his girlfriend. It is the cutest thing! The kids actually all did pretty well in the movie. Afterward we hopped over to Red Robin for lunch before my mom had to take Payton back home. We miss her and sweet little Addy! Last weekend some of our family from Philadelphia was in town, so we spent the weekend at my parents’ house swimming and simply hanging out and catching up. My cousin Carl is in the Navy and is stationed in Mississippi right now but will be heading overseas in the next couple months. I’m so glad we got to see him before he left. We are so very proud of you, Carl! There’s too much sass to handle! David took the 5th off too, so since we had such a low-key day on the 4th, we decided to take the girls out and do something fun. We took them to play in the splash pad at Bridge Street. I love splash pads because they always have so much fun running around, splashing and getting soaking wet. They played in the splash pad for about an hour before getting them dried off and changed. We ended up riding the carousel several times before grabbing some lunch and heading home. I’m so glad we got to spend this time together, especially since David was out of town all weekend. It did make the week seem really off though…like I kept thinking that Wednesday was Saturday, then on Thursday it felt like Sunday, except we didn’t go to church so it sort of felt like Saturday still. Then I worked Friday, which I hardly ever do any more, so that threw me off…and then this weekend felt more like week days since David was out of town…it’s safe to say I’m all mixed up!! Did the holiday throw anyone else’s week off? Since I worked Friday and David was out of town, I took the girls to my parents’ house to spend the night on Thursday night so I wouldn’t have to get them up so early and take them over there by 6 am on Friday morning on my way to work. They also graciously agreed to keep them Friday night as well, so I had two nights in a quiet, empty house by myself! It was actually a nice change of pace. Of course I wouldn’t want it to be that way all the time, but time alone (like really alone) every now and then is kind of nice. My parents’ found this Frozen sleigh at Walmart on clearance, so they got it and brought it home. They had a blast riding in their new toy for the past couple days. Well, that’s about all I’ve got. This morning starts our much awaited swim lessons and I’ve been praying that they go well. I’m very excited (and a bit anxious) to see how they take to it (especially Raley). I really hope that she finds that swimming and going under water is fun and that she will end up wanting to learn. I hope that you have a wonderful week! Got any fun plans coming up? I’d love to hear about it!